Winning the Shell Houston Open would catapult McIlroy right back to the top of the rankings once again and thrust him, apparently against his will, back into the harsh glare media spotlight just 10 days before the first round of the Masters. Given McIlroy’s propensity for following mediocrity with stunning brilliance, you wouldn’t put it past the curly-haired Holywood genius to pull it off. However, despite the closing 65 at Doral that drew a line under his accidented start to the season, it might be a week too soon for such heroics. Patently ill-prepared for the start of the season following an all conquering end to the 2012 campaign, the two-time major winner is playing catch up. Despite what his girlfriend Caroline Wozniacki has described as his almost obsessive love for the gym, the Ulsterman’s work ethic is as sporadic as that of most 23-year olds we’ve met. He’s no Vijay Singh, no Pádraig Harrington and certainly no Tiger Woods, which is probably a good thing in many ways. What appears certain is that McIlroy is not enjoying it too much right now. The attention he has received since he upped the ante by signing hat multi-million dollar deal with Nike has not helped. The burdens that come with being the anointed one - the expectations, the media intrusion, the constant criticism - have increased exponentially and he’s plainly struggling to deal with them. Rory McIlroy in his first event as a Nike player in Abu Dhabi in January. Picture Stuart Adams www.golftourimages.comWhen he was a child he would practice day and night, dragged in unwillingly by his parents as he hit bunker shots in darkness in a freezing bunker at Holywood Golf Club, snot frozen to his cherubic face. Finding a balance between that kid, the freewheeling tyro that’s won two majors by the astounding margin of eight shots, and the overwhelmed youngster who was forced to flee the golf course mid-round at the Honda Classic is a challenge right now, as he confessed in Humble on Tuesday morning. Asked if there was a sense of relief that he does not have to carry the burden of being No 1, he could not lie. He hit balls at a public course in Miami last Friday, wearing shorts and carrying a pencil bag with a Manchester United logo, just like any other 23-year old golf nut. It was almost a cry for a life more ordinary, for normality, for a few hours at least. An escape from the fuss. Q. When you go and play, hit balls as you did at the muni range, does that kind take you back to what golf, the essence of golf and why you started playing golf? RORY MCILROY: Yeah, exactly. You go and you hit balls because you want to and you love the game, and yeah. I wanted to go and practice and that was the closest place and it’s totally fine for me that I go and practice with everyone else. It’s no big deal. 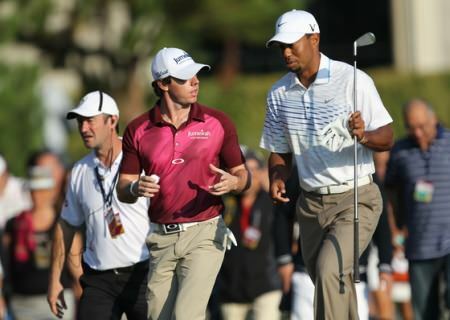 More like Phil Mickelson than Woods in terms of his work ethic, McIlroy was the subject of an interesting article by a Spencer Vickery, an English PGA professional with an MSc in Sports Psychology, on the website www.thesportinmind.com. (Thanks DMV for the heads up). “McIlroy we could say that he clearly enjoys the status and fame that comes with his golfing success, he likes to put on a show and who could blame him at 23 years of age. I think it’s fair to say that McIlroy certainly has many of the characteristics of an ego orientated player but has managed to keep these at bay with a decent level of task orientation. A smiling Rory McIlroy at the start of the season. 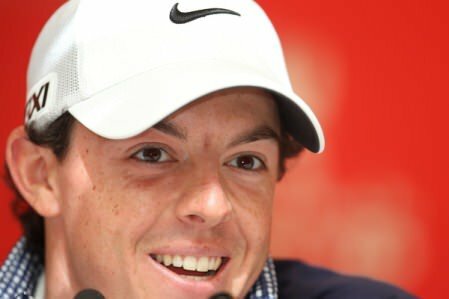 Picture: Fran Caffrey/www.golffile.ie.Right now McIlroy is feeding off that closing 65 that gave him a top 10 finish in the WGC-Cadillac Championship at Doral. Growing up he wanted to be like Tiger. Then, when his star was on the rise and Woods was mired in his post fire-hydrant slump, he said before the 2010 Ryder Cup that quite a few players would fancy their chances against the 14-time major winner. 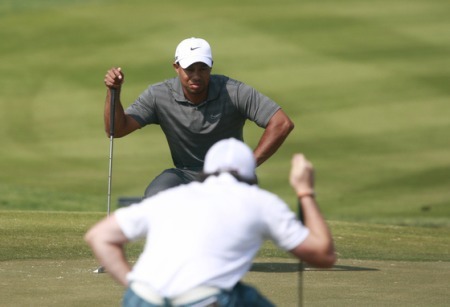 McIlroy says he will learn from Woods’ travails and the way he never appears to give up during a round. “Of course. We’re not machines. We’re humans. We go through highs and lows. It’s just sport and that’s golf. “… I’ve always said he’s been one of the greatest fighters on a golf course, you know, if things aren’t going his way he’ll dig in and get whatever he can out of a round. He just sticks in there. That’s one of his biggest things. McIlroy isn’t trying to play like anyone other than McIlroy right now - the McIlroy that dominated 2012. He’ll get more of that in Haiti when he returns there next Monday and Tuesday on a field trip with UNICEF Ireland. He was still coming to terms with that 2011 Masters implosion when he visited the ravaged country two years ago and returned to win the US Open at Congressional. Right now he’s just in Humble. A win would make his king of golf again but you believe him when he’s asked if he knows what he has to do this week to get back to No 1. The goal is to start swinging like a kid again. Ego be damned. Rory McIlroy in his first outing with Nike Golf in Abu Dhabi. Picture Stuart Adams www.golftourimages.comRory McIlroy was the third highest earning golfer in the world behind Tiger Woods and Phil Mickelson last year.